Strawberry Cream Cheese Pie is perfect for spring or summer celebrations. A homemade buttery crust is filled with an easy cream cheese pie filling and topped with fresh strawberries. 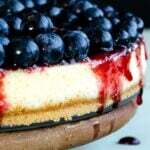 It is a light and super delicious dessert that impresses everyone. The filling in this strawberry cream cheese pie gives you a feeling of cheesecake which is much easier to make. Start with beating heavy cream until it thickens. In another bowl, beat together cream cheese, honey and vanilla until smooth. Fold the whipped cream into the cream cheese mixture using a spatula and spread it into the cooled pie crust. 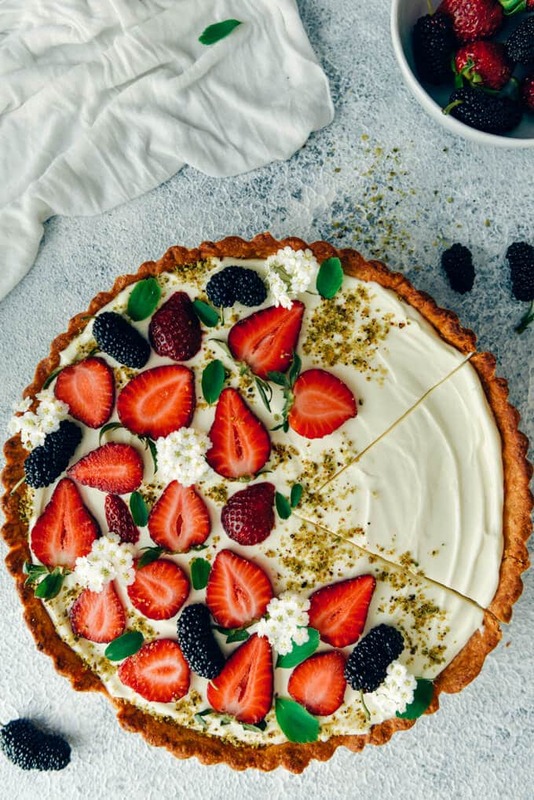 This is such a great no bake cheesecake filling that you can use it on any pie, top with whatever fruit you have on hand and create your own cream cheese pie recipe. It would even be a wonderful change in our Strawberry Chocolate Cake recipe, which is one of your favorite cakes on the blog. To give the cake a lighter taste, just substitute this amazing filling for chocolate ganache. 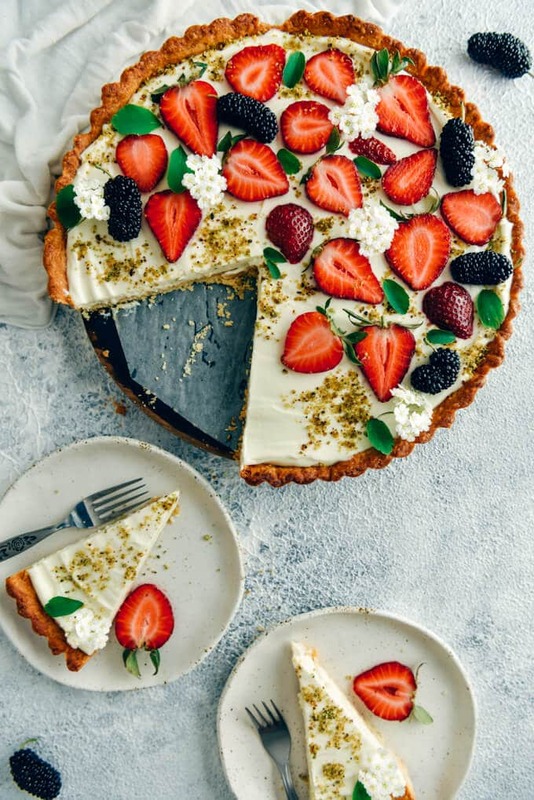 If you are a fan of the lovely combination of strawberries and cream, I’m sure this pie will become a hit for you. With a cream cheese twist this time.YUM! Oh and if you are after a richer and sweeter treat, you can spread a little Homemade Strawberry Jam on the filling first and then top with fresh strawberries. This is a classic buttery crust that you can easily make at home with five ingredients: flour, sugar, salt, cold butter and cold water. It is blind baked, cooled and filled with that cream cheese mixture. Believe it or not, it’s really easy and you will feel like a pro after making it once. We’ve been making this crust for years, mostly for this strawberry cream cheese pie recipe and it has never failed. Cut butter into flour, sugar and salt mixture and pulse the food processor until crumbly. Then add cold water, 1 tablespoon at a time and pulse until the dough forms a ball. Wrap and refrigerate for an hour. Roll out the dough on a baking paper larger than the pan and place it into the pan so that it covers the sides as well. Put it in the freezer while you preheat the oven. Remove and prick the dough with a fork. Cover it with baking paper and fill it with dried beans. Bake until the edges are slightly golden brown. Remove the beans and the baking paper on it, bake another 15 minutes or until the bottom is golden brown. Cool it completely before filling. Cream cheese pie with a homemade buttery crust filled with cream cheese pie filling and fresh strawberries. Put flour, sugar and salt in the food processor. Pulse a few times. Cube the butter and add it into the flour mixture. Pulse until the mixture gets crumbled. Add cold water, 1 tablespoon at a time and pulse until the dough starts to hold together and forms a ball. Don’t overmix. Shape the dough into a round disk, wrap and chill in the refrigerator for an hour. Roll the dough out on a baking paper, slightly larger than a 9 inch pan. Butter the edges of the pan and place the dough with the baking paper into the pan so that it covers the sides. Trim the edges. Cover and place in the freezer while you preheat the oven. Remove the pan out of the freezer, poke holes at the bottom with a fork. Place baking paper on it and fill it with dry beans. Bake for 20 minutes. Remove the beans with the baking paper and bake for another 15 minutes or until the bottom is golden brown. Let the crust cool completely. Whip the heavy cream until thickens, for about 3-4 minutes. In another bowl, beat together the cream cheese, honey and vanilla until smooth. Fold the whipped cream into the cream cheese mixture using a spatula. Spread the filling into the crust. Sprinkle ground pistachio and decorate with sliced strawberries. Refrigerate at least 2 hours before serving. This post was originally published in 2009 and we are updating it today with new pictures and additional information. Thank you Natalie! Glad you love the updated photos and the pie. To be honest, we are a bit embarrassed whenever we look at those old photos, but they are a part of the history of this blog and we don’t want to get rid of them. hahah We will all improve our work in positive ways so there is no way having shame on what we have did but it is the truly evidence for our effectiveness. Good job!! Thanks Natalie for your encouraging words! We still have A LOT to learn. This must be what strawberry tart dreams are made up of. So beautiful and tasty. Oh and I LOOOOOVEE the photos. Well done. Thank you Carol! It is always a hit whenever I make it. Hope you have a chance to try it one day. I haven’t made this yet. What size tart pan do you use? Looks yummy! Thanks Berta! I used a 9-inch pan for this recipe. The look really scrumptious!! I love how you decorated them, your husband is very clever! Yumm! and pretty too! Hey I left and award for you on my blog go check it out. How cute is that. Now, all I need is a very large spoon and a bib lol. oooh, this looks so good! I made something similar last summer with just golden plums. I can’t wait until summer when we have lots of nice fruits again! What a fun team project! Love both versions – looks soooo good!